Meeting 4x per year, this is our last meeting of the third year of 100WomenWhoCare-Fredericton. 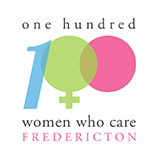 100 women x $100 = $10,000 and now we are well over $100,000 raised for Fredericton not for profit charities. Ladies, invite your friends to share the experience and feel joy of giving together for a local need.